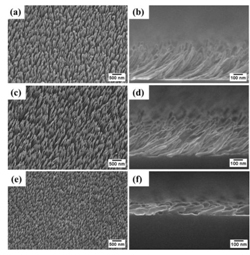 In this study, we demonstrate the effects of substrate temperature on the growth of high aspect ratio silver nanocolumns using e-beam evaporation. When grown at room temperature, oblique angle deposition of soft metals such as silver, copper, etc. generally produce low aspect ratio columns or collapsed structures compared to high melting temperature metals such as titanium, chromium, nickel, etc. Using a custom-built cryogenic substrate cooling apparatus, silver nanostructured thin films were fabricated side-by-side at ~100 K and ~300 K. The films grown at low temperature show a significantly improved columnar morphology with a 53% increase in the aspect ratio, and a 2.14x increase in surface area. The early nucleation of the films was studied by terminating the growths at 100 Å and 300 Å, which indicates that the improvement in the columnar morphology is due to the decrease in surface mobility of the silver atoms.